Strategic Information Management In Hospitals: An Introduction To Hospital Information Systems is a definitive volume written by four authoritative voices in medical informatics. 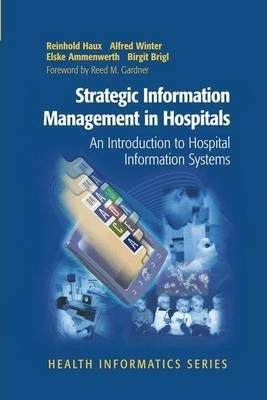 Illustrating the importance of hospital information management in delivering high quality health care at the lowest possible cost, this book provides the essential resources needed by the medical informatics specialist to understand and successfully manage the complex nature of hospital information systems. Author of the book's Foreword, Reed M. Gardner, PhD, Professor and Chair, Department of Medical Informatics, University of Utah and LDS Hospital, Salt Lake City, Utah, applauds the text's focus on the underlying administrative systems that are in place in hospitals throughout the world. He writes, "These administrative systems are fundamental to the development and implementation of the even more challenging systems that acquire, process, and manage the patient's clinical information. Hospital information systems provide a major part of the information needed by those paying for health care." Chapter highlights include: significance of information processing in hospitals; information systems and their components; health information systems; architectures of hospital information systems; and organizational structures for information management. Illustrations note 7 Tables, black and white; XXIV, 274 p.
Illustrating the importance of hospital information management in delivering high quality healthcare at the lowest possible cost, this book provides the tools and resources that every medical informatics specialist will need to manage the complexities of hospital information systems. In addition to medical informaticians, this book is an indispensable tool for hospital administrators, physicians, nurses, and allied health professionals in assisting their efforts to deliver the best healthcare possible.